Development of the complex was stalled until 2000, when the Philippine Supreme Court ruled with finality the CCP's ownership of some 35 hectares (86 acres) of prime real estate in the complex. The property is 62.4 hectares (154 acres) of land, with the rest being occupied by the Government Service Insurance System, the Bangko Sentral ng Pilipinas, and the Privatization and Management Office. It is part of Bay City (formerly Boulevard 2000) that spans 1,500 hectares (3,700 acres) of reclaimed land along Manila Bay which is occupied by the SM Central Business Park, Philippine National Bank's Financial Center Area, and PAGCOR's Entertainment City, among others. 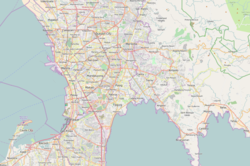 The complex is bounded by the Manila Bay to the north and west, the Philippine Navy headquarters to the northeast, Roxas Boulevard to the east, and Jose Diokno Boulevard to the south. It is divided into two zones: the Art Zone, and the Commercial and Entertainment Zone. It features several brutalist structures designed in the 1960s and 1970s by Leandro Locsin, such as the Tanghalang Pambansa, the Philippine International Convention Center, and the Sofitel Philippine Plaza Manila. Other locators in the complex include the Coconut Palace, the Manila Film Center and Star City amusement park. The Tanghalang Pambansa (English: National Theater) is the flagship venue and principal offices of the Cultural Center of the Philippines. Formally called the Theater of Performing Arts, it houses three major performing arts venues, one theater for film screenings, galleries, a museum and the center's library and archives. Designed by National Artist for Architecture Leandro Locsin, its design was based and expanded upon the unconstructed Philippine-American Friendship Center. The Tangahalan is a primary example of the architect's signature style known as the floating volume, a trait which can be seen in structures indigenous to the Philippines such as the nipa hut. Being a work of a National Artist, the brutalist structure is qualified to be an important cultural landmark as stipulated in Republic Act No. 10066. The Tanghalang Francisco Balagtas, more commonly known by its original name of Folk Arts Theater, is a covered proscenium amphitheater is where popular concerts are usually staged. It has a seating capacity of 8,458 in ten sections. The building was originally built to seat an audience of 10,000 and was commissioned by then First Lady Imelda Marcos in 1974 for the Miss Universe Pageant, which was to be held in Manila. The theater was built in record time of seventy-seven days in time for the pageant and was designed by Leandro V. Locsin. It was host to many popular musical acts of the 1980s onwards, including Puerto Rican group Menudo, British pop group 5ive, Janet Jackson, Gary Valenciano and Jay R. The Folk Arts Theater is also used as a site by different religious groups. Day by Day Christian Ministries, a large international religious organization, has leased the area since 2005. They have dedicated the Theatre as Bulwagan ng Panginoón (English: Hall of the Lord). The building is expected to be torn down in the future, subject to the development of the complex. The Cultural Center of the Philippines was conceived in 1966 when Ferdinand Marcos issued Executive Order No. 60, establishing its board and arranging for his wife Imelda to become chair of its board of directors. The Philippine-American Culture Foundation provided a 90,000 peso grant for its construction, and additional funds were taken from the Cultural Development Fund and the Special Fund for Education. It soon became the premier symbol of what would be called Imelda's "edifice complex". A comprehensive master plan for the development of the complex was unveiled in 2003. The plan would divide the CCP Complex into six clusters, each of which will be anchored by a major building. First, the Promenade, which will tentatively be named after Lucresia Reyes-Urtula, will include retail and other mixed-use facilities, as well as dock facilities. The second cluster will be the Arts Sanctuary, which will serve as the complex's cultural core. To be anchored by the Tanghalang Pambansa, it will contain a new performing arts theater, the artists' center, a bandstand, the CCP's Production Design Center, and other open areas. The third cluster, the Green Zone will contain a mix of museums and parks with commercial and office spaces. Fourth, the Creative Hub cluster, will contain spaces for creative industries. Fifth, the Arts Living Room, is envisioned to be a high-density, high-rise area that will house condominiums and similar residential projects. The final cluster, the Breezeway, will be located by low-rise, low-density commercial structures with seafront entertainment facilities. Covered walkways, plazas, and bicycle lanes are planned to connect the various buildings and clusters to ensure a pedestrian-centered design. The master plan is envisioned to be completed in four phases, from 2004 to 2014; ₱5 billion will be needed for the plan's first five years, and another ₱8 billion for the plan's latter half. A design contest was held in 2005 to design the first two clusters. Three firms won for their concepts; Syndicated Architects, Manalang-Tayag-Ilano Architects, and JPA Buensalido Design. The concepts of each winner will then be presented to prospective investors and stakeholders for approval. In 2011, Leandro V. Locsin Partners, Architects won the design contest for the Artists' Center and Performing Arts Theater, the two buildings that will anchor the Promenade and Arts Sanctuary Clusters respectively. The proposed Artists' Center will house offices and rehearsal spaces for the CCP's resident companies, a black box theater and rooms for educational programs. The winning design is akin to a traditional Badjao village or a mangrove forest, with rooms and pavilions supported by slim pilotis. The proposed Performing Arts Theater will contain a 1,000 seat conventional proscenium theater and a black box that will seat 300-500 people. In contrast with the Tanghalang Pambansa's massive travertine block, the façade of the new theater will be dominated by its main seating bowl clad in reflective material, evoking a wave rising out of the sea. On January 19, 2016, construction of a new black box theater started with the aim of eventually integrating the new structure into the proposed Performing Arts Theater. Estimated to cost ₱50 million, the new theater will be three to four times bigger than the Tanghalang Huseng Batute, the current black box facility of the CCP. 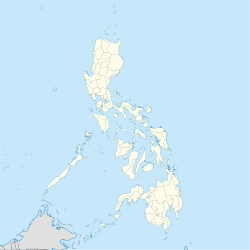 ^ The Cultural Center of the Philippines Complex lies between Pasay and the City of Manila. The boundary between the cities is Vicente Sotto Street. Landmarks in CCP Complex that lies within the City of Manila include the Tanghalang Pambansa (National Theater), the Tanghalang Francisco Balagtas (Folks Art Theater), and the Coconut Palace which is owned by the Government Service Insurance System. ^ "Reclamation". Philippine Reclamation Authority. Retrieved 23 May 2016. ^ a b "Cultural Center of the Philippines". Philippine Reclamation Authority. Retrieved 29 January 2017. ^ Lico, Gerald (2003). Edifice Complex: Power, Myth and Marcos State Architecture. Quezon City, Philippines: Ateneo de Manila University Press. pp. 178 p. ISBN 978-971-550-435-5. ^ a b Gerard., Lico (2003). Edifice complex : power, myth, and Marcos state architecture. Quezon City: Ateneo de Manila University Press. ISBN 978-9715504355. OCLC 53371189. ^ ‘Commercialized’ CCP embraces the poor. ABS-CBN News Online. Retrieved 3 March 2012. ^ 3 architect groups win CCP design contest. ABS-CBN News Online. Retrieved 3 March 2012 Archived here. ^ "Architectural Design Competition Exhibit Opens at CCP". GMA News Online. 5 September 2011. Retrieved 3 March 2012. ^ a b CCP Architectural Design Competition Background Information. Cultural Center of the Philippines. Retrieved 9 October 2011 Full Text available here. ^ "After 3 decades–and 'against all odds'–CCP breaks ground on a new theater". Philippine Daily Inquirer. 6 February 2016. Retrieved 14 December 2016.